L-arginine alpha-ketoglutarate (AAKG) is a 2:1 salt formed from two parts arginine and one part alpha-ketoglutarate. 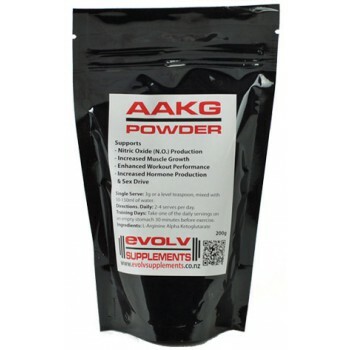 AAKG is widely used in Pre-Workouts available as it is well recognised for its vasodilation properties, stimulating Nitric Oxide production & amino acid synthesis. Making it popular among athletes as this makes more proteins available to the body during exercise. L-arginine stimulates protein synthesis, which helps the body build muscle and increase their size, strength and endurance. It helps to maintain the integrity of the liver, skin, joints & muscles & supports healthy levels of blood sugar, hormones & immune system. It is also used to increase sexual energy, hormone production & for the prevention and treatment of erectile dysfunction disorder and sterility in men. - By relaxing blood vessels & dilating them, AAKG helps to stop blood flow restriction & increases available oxygen throughout the body. - Can encourage muscle protein synthesis which increases muscle endurance, size & strength. 3g or a level teaspoon, mixed with 50-150ml of water. Daily: 2-4 serves per day. Training Days: Take one of the daily servings on an empty stomach 30 minutes before exercise.